6 Bedroom Detached House For Sale in Washington for Asking Price £250,000. 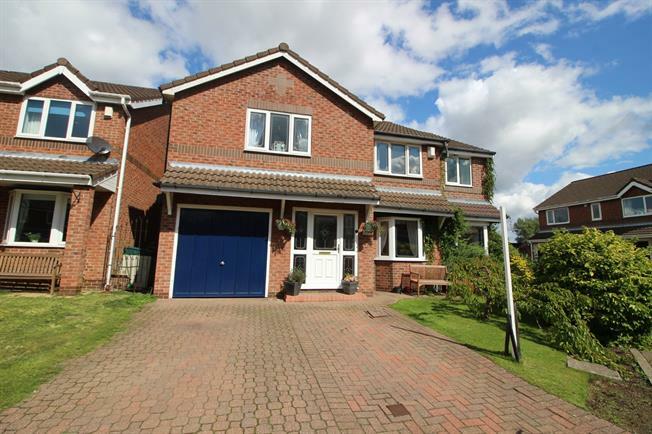 This spacious six bedroom detached house is nicely placed on the popular Freesia Grange. This small cul de sac is within easy reach of transport links, major travel routes, Washington's local amenities and the Galleries shopping centre. Biddick sports academy and St. Roberts new minster catholic school are also placed within close proximity. Once at the property you will discover a welcoming entrance hall, a large lounge, a dining room, a snug perfect for families and a well presented kitchen dining room. To the first floor you will find six good sized bedrooms with the master boasting an en suite. Also on the first floor is a family bathroom WC and a bathroom shower room. Externally there is a private low maintenance paved garden to the rear, a double driveway to the front and a garage. This truly is a must view property to arrange your viewings please call 0191 4166919. UPVC double glazed door. Double glazed uPVC window facing the front. Radiator, laminate flooring, coving. Double glazed uPVC bay window facing the front. Double radiator, carpeted flooring, picture rail, coving. UPVC sliding double glazed door, opening onto the garden. Double glazed uPVC window facing the rear. Radiator, carpeted flooring, picture rail, coving. UPVC double glazed door, opening onto the garden. Double glazed uPVC window facing the rear and side. Double radiator, laminate flooring, part tiled walls. Roll top work surface, wall and base units, one and a half bowl sink, electric oven, induction hob, overhead extractor, integrated dishwasher, space for fridge/freezer. There is also a built in storage cupboard. Double bedroom; double glazed uPVC window facing the front. Radiator, carpeted flooring, dado rail, coving. Double glazed uPVC window facing the side. Radiator, tiled flooring, tiled walls, spotlights. Low level WC, panelled bath, shower over bath, pedestal sink, extractor fan. Double bedroom; double glazed uPVC window facing the rear. Radiator, carpeted flooring, dado rail, coving. Double glazed uPVC window facing the rear. Radiator, laminate flooring, picture rail, coving. Double glazed uPVC window facing the rear. Tiled flooring, tiled walls, spotlights. Low level WC, panelled bath, shower over bath, pedestal sink, extractor fan. Double glazed uPVC window facing the side. Radiator, tiled walls, spotlights. Low level WC, single enclosure shower, pedestal sink, extractor fan. A double driveway to the front leading to a garage. To the rear is a private low maintenance paved garden.